Bartley Green Leisure Centre has recently undergone a change in ownership and there have been changes in the availability of the attached school premises. As you all know we have been trying to negotiate with Bartley Green so we can keep training on a Saturday, but sadly we have not been able to come to any arrangements to make this possible, so with a heavy heart we have to say no more Saturday training at Bartley Green from Saturday 22nd April 2017, but we will still be there on a Wednesday 7pm – 8pm. We can no longer go in early at 6.30pm, so please don’t arrive and go in before 7pm. However from Saturday 6th May 2017, Saturday training will be at a new venue , Longbridge Methodist Church, Bristol Road South, Birmingham B45 9TY opposite the drive in McDonalds at the current time of 11am – 12.30pm. The class will be split between Sensei Austin Birks 5th Dan and Sensei Sue Hession 4th Dan with sessions for senior and junior grades. Sensei Steve O’Reilly 3rd Dan will be taking the Halesowen classes. Thanks for your understanding and sorry for any inconvenience this may cause. See the Google Map here for directions. 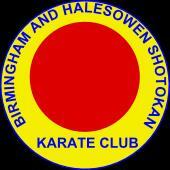 Copyright Birmingham & Halesowen Shotokan Karate Club 2014. All rights reserved.